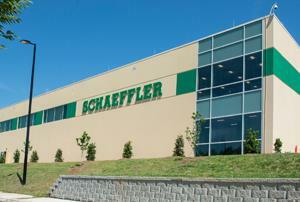 Schaeffler recently celebrated the grand opening of its expanded manufacturing plant and new administrative building in Fort Mill, South Carolina. The $36.5 million capital investment, which has generated approximately 105 additional jobs, resulted in the construction of a new administrative office building, the expansion of one of two factories located on the company's Fort Mill campus, and a reworked plant entrance to accommodate the growth and increase in traffic. The factory expansion adds nearly 35,000 square feet of additional manufacturing space in the company's Fort Mill 1 Plant and increases capacity in stamping, heat treatment and assembly for thrust bearings used in 8-, 9- and 10-speed automatic transmissions. The new administrative building encompasses more than 64,000 square feet of office space, including state-of-the-art workstations and a multimedia conference center. "Schaeffler is excited to celebrate another milestone in our five-decade partnership with the state of South Carolina," said Schaeffler America CEO Bruce Warmbold. "The increased production capacity in our Fort Mill 1 plant enables our company to offer more job opportunities for residents of the Palmetto State as well as more high-tech solutions to our automotive and industrial customers." The York County expansion is part of a $164 million capital investment in Schaeffler's South Carolina operations that was announced in January 2015. Collectively, the investments are expected to create more than 440 new jobs. Headquartered in Herzogenaurach, Germany, Schaeffler is a worldwide manufacturer of high-precision components and systems for the automotive industry as well as rolling and plain bearing solutions. Schaeffler's American operations are headquartered in Fort Mill and are responsible for the engineering, production, sales and marketing of the LuK, INA and FAG brands. For more information, visit www.schaeffler.us.